Public Security Minister asks A-G to investigate MK Odeh after he took part in Jerusalem conference organized by terror groups. 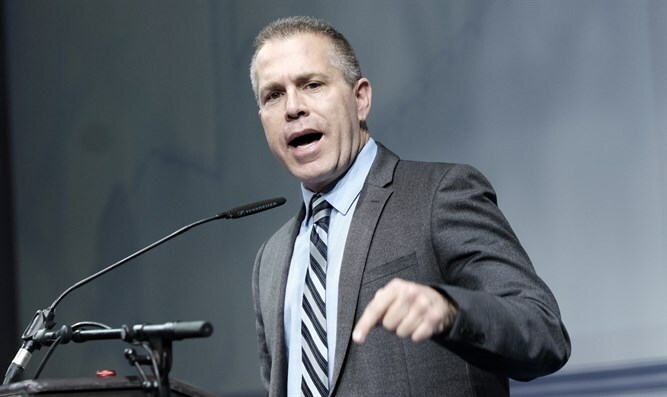 Public Security Minister Gilad Erdan (Likud) on Monday evening asked Attorney General Avichai Mandelblit to investigate whether Joint List chairman MK Ayman Odeh assisted terrorist organizations. Erdan’s request came after Odeh took part in a conference at the Russian embassy in eastern Jerusalem, during which it was planned to declare Jerusalem as the capital of "Palestine". Jerusalem district police commander Yoram Halevy prevented the conference from taking place. The conference was planned by the Popular Front for the Liberation of Palestine and the Democratic Front for the Liberation of Palestine, two terrorist organizations. "Ayman Odeh provided another example of his behavior as an enemy of the state and as a supporter of terrorist organizations. I intend to immediately approach the Attorney General to open a criminal investigation against him for assistance to a declared terrorist organization. MK Odeh, you do not belong in the Knesset, but rather in prison," Erdan said. Odeh was livid over the police officers’ arrival at the scene of the conference, saying, "I thank Russia for the conference to declare Jerusalem as the capital of Palestine. This is how these occupiers behave, they will suffer defeat, and Jerusalem will remain with its residents, uplifting and victorious and a capital for Palestine." Last October, Odeh caused an uproar when he telephoned Hamas leader Ismail Haniyeh to congratulate him on the reconciliation agreement between Hamas and Fatah. In an earlier incident, he announced he would not attend the funeral of former President Shimon Peres, but then chose to visit archterrorist Marwan Barghouti in prison.